Like a triumphant ant able to carry a rock thousands of times the weight of it’s own body, sprouts are some the most powerful plants on the planet. Sprouting is the process of germinating a seed. With proper airflow and regular rinsing a young shoot will protrude from the shell which begins to feed on the starch of the seed. This breaks down the seed making it easier on digestion. More importantly though, sprouting transitions the seed to a much more nutrient-dense stage in their lifespan. “One pound of sprouts provides the combined nutritional advantage of thousands of baby plants. Biologist tell us that in the first 5 – 10 days, young plants achieve their maximum nutrient density. Sprouts truly are a miracle because of their tremendous value to our health. Also, large amounts of sprouts are easily attainable in any climate with a few simple tools. There is some variance depending on what you’re sprouting. Generally, just soak the seeds 6 – 8 hours or overnight. Then rinse and drain the sprouts 3 times a day. This is done easily using a sprouting jar or even a mason jar with a cheese cloth over across the top (held by a rubber band). After a final rinse, drain most of the water then place them upside down at a 45º angle so they continue draining while letting air in. Leave the jar out of direct sunlight until the last day. After just a few days you’ll have container of fresh, living and enzyme-rich living food that’s ready to eat. Due to their high level of digestive enzymes, sprouts can be a helpful with many digestive issues. The many different seeds to sprout means there’s all kinds of flavors and a plethora of different nutrient profiles. Some of the most powerful sprouts you can grow are radish seeds. 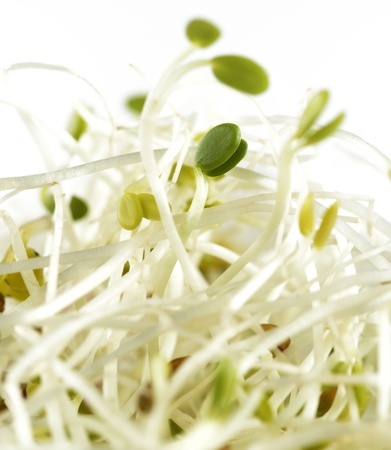 Besides flax and chia, raw radish sprouts have a higher level of omega-3 fatty acids than any other plant food. They’re also high in omega-6s, vitamin C, B6 and B9. That’s just the tip of the iceberg with sprouts though. We all know broccoli is good for us. Cruciferous vegetables are high on the list of cancer fighting foods. One of the reasons for this is because of their antioxidant content. Sprouted broccoli seeds can have up to 50 times the level of the antioxidant sulforaphane found in fully grown broccoli plants. It’s also exceptionally high in Vitamin A, C, E, K and selenium. All of this is combined with a myriad of other minerals, phytochemicals and other factors that help create sprouts’ ability to lower blood pressure and triglyceride levels — contributing factors to heart disease when levels are too high. Every type of sprout offers it’s own host of benefits for your body. 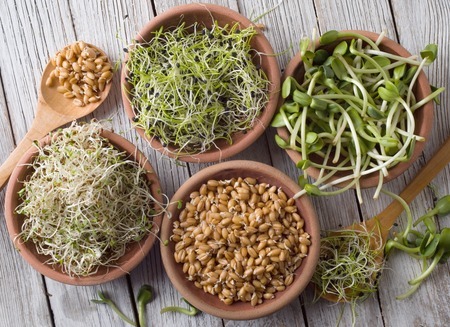 So by rotating what you sprout you can get a well-rounded mix of the nourishment that sprouts offer. Along with their surprising level of nutrition, the rate at which sprouts can grow is astonishing as well. Your sprouting jar can be full of sprouts in a just a few days from just a couple of tablespoons of seeds. By starting a new batch every few days you’ll always have fresh sprouts on hand — at a fraction of what they’d cost in a store. You also get to control the quality of the water they’re grown in this way. Sprouts are a versatile thing to keep on hand in the kitchen. They add a great texture to salad and toppings for all kinds of dishes. Sprouts will keep well for several days stored in the fridge. Unlike traditional gardening methods, there’s not much labor involved. This means it’s an easy project you can share with your family. It’s also a great way to stay connected to nature, especially in the winter months. Also, because they grow so quickly, kids will enjoy the fruits of their labors without much delay. Sprouts have a great taste but they’re not as strong as their fully grown counterparts which is another reason they can be excellent foods for kids to get used to. With just a small amount of raw sprouts, kids can get a lot of the nutrients they would get from eating a larger volume of vegetables which they may not be so quick to eat. Sprouts are a miracle food! Sprouts give you access to vibrant plant-based nutrition all year at a low cost. Growing the sprouts and enjoys all their flavors is great for both thew kids and their parents. For some people, however, they play a more serious role. The high levels of enzymes in sprouts combined with their nutritional density makes them beneficial in preventing disease as well as a fantastic aid to people suffering from an extensive array of chronic ailments. 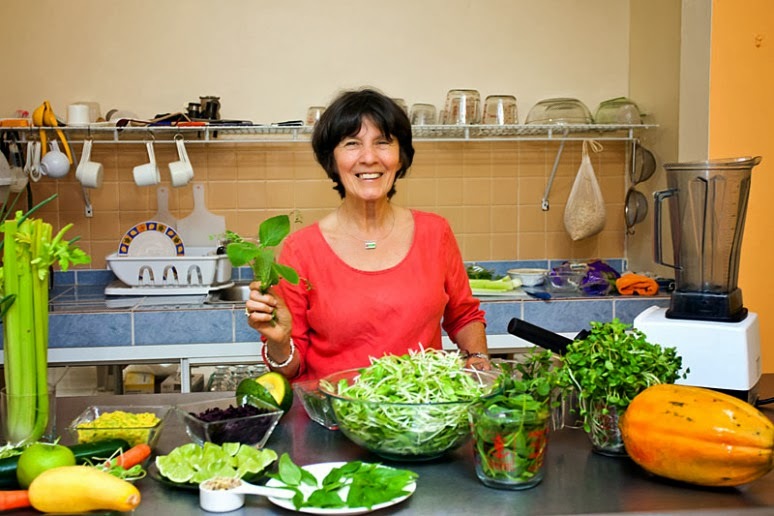 Ann Wigmore, pioneer in the raw & living foods movement for many decades, used sprouts along with wheatgrass juice, colon hydrotherapy and other holistic practices to help people suffering from chronic diseases heal themselves. Ann Wigmore founded the Hippocrates Health Institute (W. Palm Beach), the Optimum Health Institute (San Diego) and the Ann Wigmore Health Institute (Puerto Rico), where she proved time and time again the disease- fighting potential of living foods you can grow right at home! Sprouts have the power of the mature plant condensed and contained within them, bursting at the seams with living energy — like an acorn ready to become a mighty oak tree. Growing sprouts is a deeply satisfying hobby, a gift to your body and an investment in your health. “Sprouts: The Miracle Food,” Steve Meyerowitz, Sproutman Publications, 2013 10th ed.